Day 4 of Maxwell's 31 days of fun consisted with Maxwell playing in the garden and having a whole load of fun. 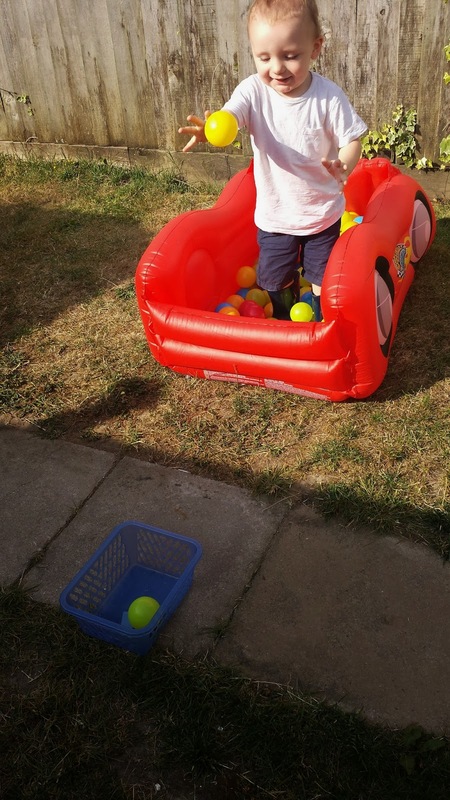 A few weeks ago we were asked to join in with Chad Valleys #100daysofplay and we were sent a lovely car ball pit for Maxwell to enjoy. Since having the ball pit Maxwell has spent a lot of time in there. Maxwell adores his new ball pit, the ball pit came without balls so Maxwell spent a few days using the pit as a pool which cooled him down on hot summer days. The pit isn't huge but it is big enough to splash around in. 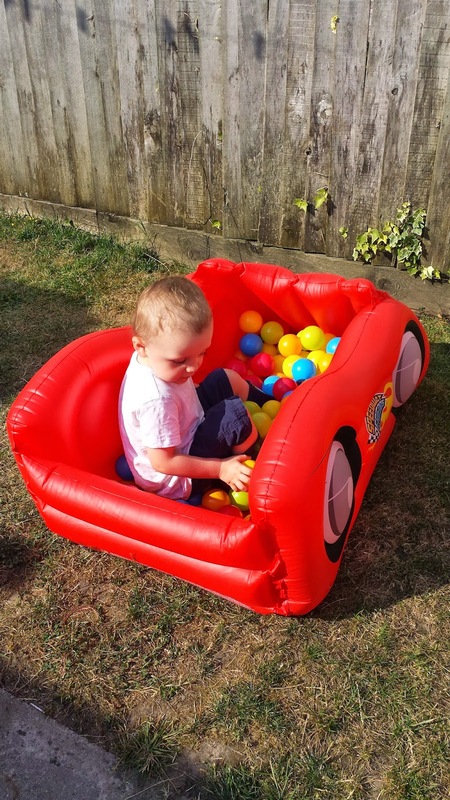 The ball pit is brightly coloured and is an attractive shape. Once we had bought balls for the pit, we found that it could fit up to 200 balls in which is good amount of balls to enable a child to have a lot of fun with. Maxwell loves to make his own games up whilst in the ball pit. Maxwell's favorite games consist of throwing balls into a basket and he adores counting them into the basket. If he misses one he shows he is disappointed and throws the balls out of the basket back into the ball pit. Maxwell also loves to use a cupcake tin to separate ball colours. Maxwell is starting to learn colours and I believe this game is starting to really help him. Maxwell's other favorite activity is to throw balls down his slide. 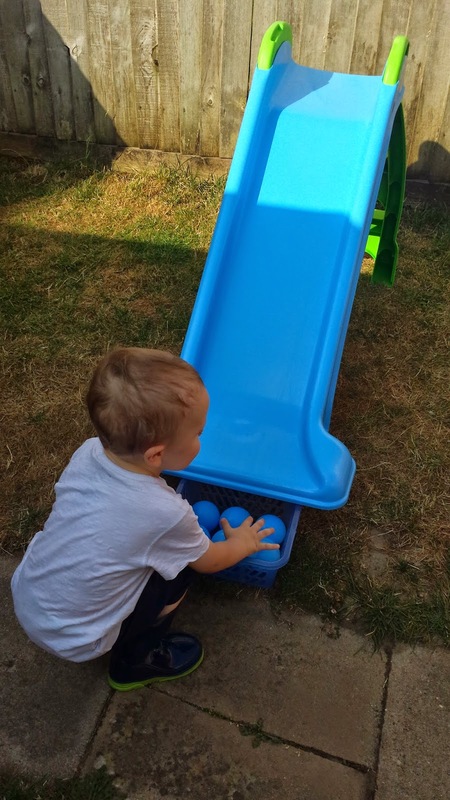 Maxwell lays a basket at the end of the slide and enjoys seeing where the balls roll to. 9 times out of 10 Maxwell manages to get the balls into the basket and every time he does he screeches in happiness. It is lovely to see Maxwell being so imaginative and making his own fun games up. 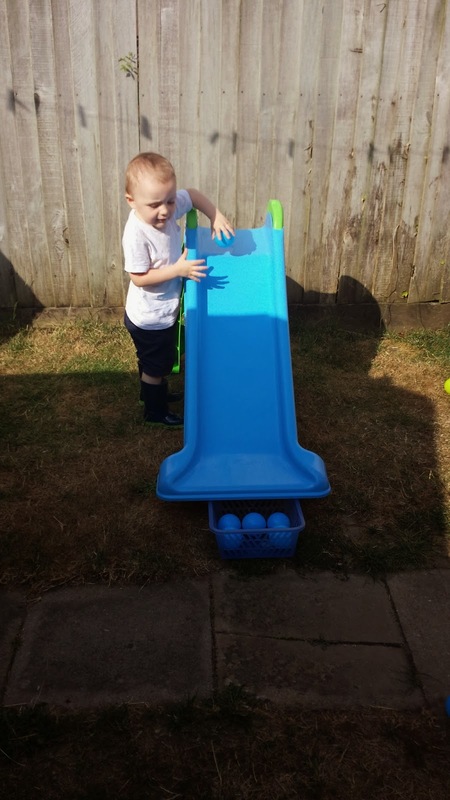 Not only are they fun, imaginative games but they are also educational, they are helping him learn to catch, throw and it also helps him learn his colours and count numbers. 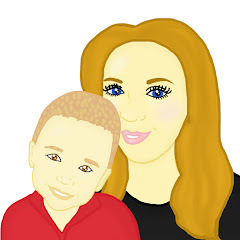 However we did receive a ball pit which is included in this post. Everything written in this post is my own, honest opinion.